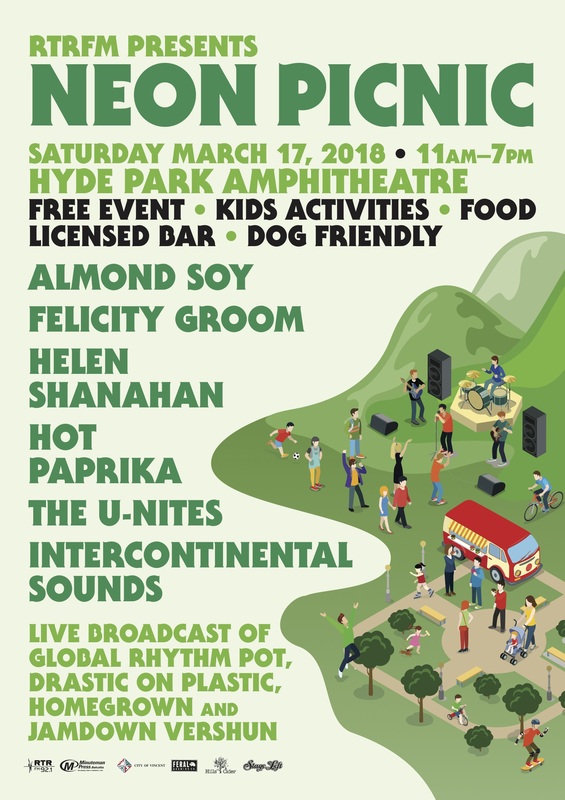 Now in RTRFM’s 41st year, Neon Picnic returns as we bring the radio to you live on Saturday March 17th in the amazing surrounds of the Hyde Park Amplitheatre, 11am – 7pm. Spend the day with the us and our line up of Saturday shows; Global Rhythm Pot, Homegrown, Drastic on Plastic and Jamdown Vershun, plus special musical guests. Join the RTRFM presenters as they play you their favourite tunes live and direct. Come and bask in the musical majesty at this all-day event, as we chill out on the grass of Perth’s most beloved park. Bring the kids for a play on a bouncey castle, keep them busy at our arts and craft centre, and hula hooping workshops for the kids and adults from hooping magician Young Hoops. Plus, the Mums and Dads can relax in our licensed bar thanks to Feral Brewing Company, The Hills Cider Company and Undertow Wines or grab a bite and coffee from Meat Candy, Pockets Falafel and Double Shotz. Entry is free and you are welcome to come and go as you like. Pull up a slice of grass, bring a picnic and enjoy local music and Perth’s best radio station live. Stay with us into the afternoon with pop-folk pioneer Helen Shanahan, the legendary and awe-inspiring Felicity Groom, and the straight fire dub of The U-Nites. ‘Neon Picnic’ is a free, family-friendly event, with activities for children all day long, and a licensed bar will be on site. Thanks to our sponsor City of Vincent. Plus support from AO Lets Go Print and Distribution, MinuteMan Press Balcatta, Feral Brewing Company, The Hills Cider Company and Stage Left Design. WHO: Almond Soy, Hot Paprika, The U-Nites, Felicity Groom, Helen Shanahan and Intercontinental Sounds. Bring a picnic but no BYO alcohol. Licensed bar on site with all proceeds going to RTRFM.